This delicious recipe makes a brilliant meat-free alternative at Christmas or throughout the winter. 1. Preheat the oven to 200°C, gas mark 6. Grease two 18cm sandwich tins and line the bases with circles of baking parchment. 2. Discard the coarse stalk ends from the parsley. Chop enough to give 1 tablespoon and mix in a small bowl with the yogurt and lemon juice. Chill. Roughly chop the remaining parsley and put in a food processor with the thyme, walnut pieces, cheese, garlic and chilli. Blend lightly to mix. Melt 25g of the butter and add to the pesto. Blend lightly again to mix. 3. Thinly slice the parsnips, lengthways. Melt the remaining butter in a frying pan, add the parsnips and fry, in batches, very gently for about 12 minutes or until softened and pale golden. Divide between the tins and spread the slices in an even layer in each tin. 4. Dot the pesto over the parsnips. Thinly roll out the pastry on a lightly floured surface to a rectangle measuring about 45x22cm. Cut out two 20cm rounds using a bowl as a guide. Position in the tins, tucking the edges of the pastry down the insides. Bake for 30 minutes until the pastry is risen and pale golden. Leave in the tins for 10 minutes then invert onto serving plates. Drizzle with olive oil and serve, cut into wedges, with the flavoured yogurt. 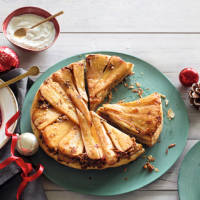 If you're making these tatins for Christmas day, they can be assembled on Christmas eve and cooked while the turkey is resting. The yogurt topping provides a lovely fresh contrast, but cranberry sauce is also good. This recipe was first published in Wed Nov 07 16:02:00 GMT 2012.